Force sensors are used as primary perception devices. They convert external force acting on it, into digital signals in order to assist the parent system for detecting, monitoring or measuring the magnitude, direction or both of the applied force. Resistive force sensors are the most widely used force sensors. Conductors are used as a main component in these sensors hence they respond to change in force due to change in diameter thereby the resistance of the conductor is altered which is reflected on the output signal. There are as well other types of force sensors available which are designed for different applications and operating parameters. Thin film force sensors are presently used in consumer electronic devices and the market is being assisted by Internet of Things (IoT). The market revenue of force sensors was estimated to be $2.03 billion in 2017 and it is expected to grow at a CAGR of 5.49% during the forecast period i.e. till 2023.Organic printed force sensors have been developed to cater the changing demands ensuring environmental regulation and uncompromised performance. Medical industry has been impregnated by wireless force sensors gradually for enhancing dynamic untethered monitoring and diagnostics in natural environment. A force sensor is a device that measures the amount of force applied .There are many ways to measure force which may be mechanical or electrical by nature. Force measurement devices are significantly varying in working principles. Factors considered by engineers while designing a force measurement decision include determining the proper output range, accuracy, price, and the ease of project integration provided by the signal conditioning electronics of the sensor. The most common means for measuring force is the load cell. Each load cell contains an elastic element to which the force is applied. The change in shape of this elastic element indicates the force applied to the load cell. What are the major applications for Force Sensors? Force sensors can measure push of any intensity which may range from a feather falling on a brick to the pressure in oil wells or in pipelines of refineries. Force sensors themselves are adaptable for many other types of measurements, such as pressure, mass, weight, and torque also. They are capable of operating over a wide temperature range when used with proper temperature compensation. They are used in various industries including chemical, electronics, agricultural sector, robotics, paper and print industry for variety of purposes. These industries have significantly improved their products by incorporating highly sensitive force sensors and have considerably improved safety and convenience of workers also. Miniature tension and button force sensors are available in market nowadays. These are ideal for instances where space is a limiting factor. They are applicable in a variety of fields such the medical sector, the test and measurement sector and the process, automation and control sector. These mini sensors have made force sensor being more versatility applied in various positions where it has been critical to determine the strain for safety. These sensors are comparably sensitive to large sized systems for force sensing. ATI has brought forward its innovative product Axia80 recently in its Force/Torque Sensor product line. The Axia80 measures all six components of force and torque as all other ATI’s Force/Torque Sensors do. Axia80 features strain gauges which are made of silicon which reduce noise, enable high stiffness through monolithic instrumented transducer. It provides overload protection up to 5 to 20 times over the sensing range. Its smaller calibration makes it preferable for delicate processes that require higher resolution and accuracy. The Axia80 is ideal for robotic assembly, grinding, and polishing applications. It communicates through EtherCAT or Ethernet. There are many such innovations in the market of force sensors even companies are looking to develop robot sensors which assist in operations of collaborative robots. 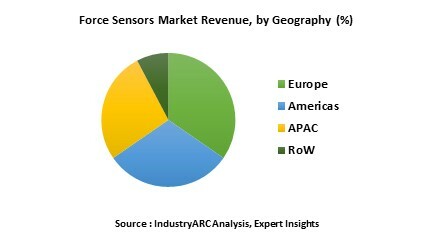 Who are the Major Players in Force Sensors market? The players profiled in the report include Spectris plc (U.K), HONEYWELL INTERNATIONAL INC. (U.S), TE Connectivity Ltd. (Switzerland), Sensata Technologies Inc. (U.S), Infineon Technologies AG (Germany), GEFRAN GROUP, FUTEK Advanced Sensor Technology Inc., Custom Sensors & Technologies, Inc., Texas Instruments, Omron Corporation. 11.7. FUTEK Advanced Sensor Technology Inc.
11.8. Custom Sensors & Technologies, Inc.